Two of our great chefs, Tommy Banks of The Black Swan at Oldstead and Pip Lacey of Murano, will be partaking in this year's BBC Two’s Great Brtish Menu 2017. The series features a line-up of 24 professional chefs with a theme that celebrates 140 years of tennis tournament the Wimbledon Championships. 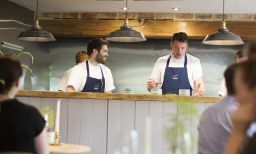 Tommy Banks will be appearing in the North East round alongside Josh Overington, Le Cochon Aveugle in York and Danny Parker from House Of Tides in Newcastle Upon Tyne, which airs on Monday 22nd May. Pip Lacey will be participating in the Central heat alongside Ryan Simpson from Orwells in Oxfordshire and Nick Deverell-Smith, The Churchill Arms, Gloucestershire on Monday 12th May.